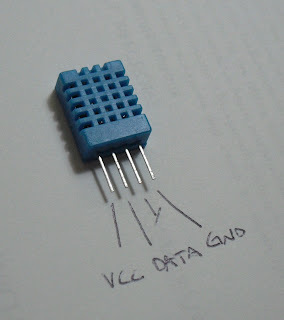 This library use DHT11 sensor to read temperature and humidity on on Atmega micro. Setup the data port connected to the micro pin, and call the function to get humidity and / or temperature. Measuring range Temperature: 0-50 Celsius. For others: Look for the newest version. to me this code works on most ATmega family. if it does not works, double check wiring, check that your DHT11 works with other devices and libraries (like arduino), then use some kind of debugging tecnique (like uart output), to check where the code stucks. I am using DHT11 with atmega 16 on 3.3v supply. The microcontroller gives control signal between (3.3V and 0V i.e correct) But dht11 responds by giving signals between 3.3V (high value) and 1.5V(low value). Any idea why this might happening? Thank u in advance for ur help! It could be your power suppy, try to supply all your devices at 5V. DHT11 datasheet, Electrical Characteristics: Power supply: DC 3.5～5.5V. I tried doing as u suggested. Now i run everything on 5 V but the problem has persisted. Now the dht11 responds between 5.0 (high) and 3.2V (low). you should check using a scope the response and compare your DHT11 to atmega communication line with the on contained in the datasheet. a simpler method should be use the uart to debug the code, to check where it stucks. I test this code with atmega128 but I always have checksum error. Do you have any Idea what is wrong? Are you using avrgcc? Have you check your wiring? What kind of checksum error do you mean? my program return always -1. Can you check the bus lines with a scope or a logic analyzer? May vladan vesý October 3, 2015 comment of the post you have linked help? I dont have the tools but I checked it with reading the signal with input capture. I think i recieve 38 pulse and the pulses should be more than 40 . You have to measure the pulse time, which must fit the datasheet timing table. thanks for the time you gave to me. I exactly did that. I wrote here the result. What pulse are you speaking of? If you take as example the Aosong DHT11 datasheet, the first Host signal must have a length of almost 18ms (milliseconds). I think all should be more than 40 but they are 39. I send the 18 ms signal with dht11/12 header version 3 you wrote. and recieve the information both by inputcapture and this header. the give back diffreent result and any way I have checksum error. Most of the time the DHT sensor comunication errors comes to incorrect signal timing. But if you have checked that the bus fits the datasheet, it could be your sensor. Check it with another micro, or even check it with another library. It happens to me to get checksum error sometimes, but it was due to emf noise. Hey Davide !! I am also getting -1 for both the values !! Please Help !! I dont have pulse n all Knowledge...!! Hello. Can you check the bus lines with a scope or a logic analyzer? Hello, see my comment below. what do you think the problem is ??? Hello. Double check your wiring. Check you F_CPU. Check your ATmega fuses. Check if the sensor is working using other hardware. Can you explain me please.. I am using DHT11 with atmega16, which file I have to use from your uploads? Hello, you can use the avr_lib_dht_02. Hi Davide, I was wondering if your library would work on Atmega1284? Hello, It should work. I've compiled it for ATmega1284P, it compiles except for the uart library, i suggest you to check the new P.Fleury library or find a ATmega1284 working one. Unluckly I've not any ATmega1284 to try it on. If i doesn't work double check your F_CPU. Let us know how it goes. Good work. Actually it does work, but I get a warning for my F_CPU. Do you happen to know what to do for this? Here is an attach picture to let you know what I mean. For the serial monitor you could use the uart output, something like the P.Fleury uart library should do the work. Hey Davide, thank you for the help I have another question now. How do you display the temperature and humidity on an LCD Screen? I am also using Atmel Stuido as my IDE. I wanted to know how I can display the output on an LCD Screen. Thank you. Hey david I'm using an Atmega 328P and your library but it seems as if the value for temperatures and Humidity never get updated. And I seem to stay in the while loop forever. Any idea why this would happen? Thanks again. Hello, have you check the updated version of this library? Apologies, I didnt mention it in my comment. Yeah I'm using dht 03 your updated version and I'm using a DHT 11 with 3 pins(Like here http://imgur.com/9BQAi0y). Any ideas? Thanks again. I am working on Atmega16 and using an LCD to show the data. But while compiling using Atmel STudio 7.0 there is always an error of "dht/dht.h" not found.